I made Iced Lemon Sugar Cookies as an excuse to try a new brand of organic butter. Normally I would have used the store brand or Land o’ Lakes, but the cash register spit out a free coupon for the organic kind, and since butter is more expensive than ever these days, I was pretty happy to redeem it. Unfortunately, I might be hooked on organic butter. The brand I tried (HEB) was a bit smoother, yellower and had a bit more flavor. Butter aside, you can make these cookies with whatever butter you have around. Mine turned out dense, chewy and very lemony. They had a lot of flavor without the icing, but I drizzled some over the top anyway. If you’re not fond of icing, just roll the cookies in sanding sugar and leave it off. 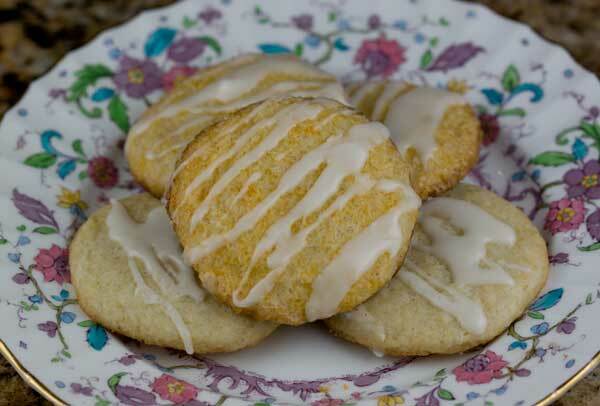 Old fashioned lemon sugar cookies with ground oats and lemon icing. Grind the oats in a coffee grinder or food processor and place them in a bowl. To the oats, add flour, baking powder and salt and stir well. Set aside. In a mixing bowl, beat butter until creamy. Beat in the sugar and lemon zest and continue beating until light and fluffy. Beat in the vanilla extract and the egg. Stir the flour mixture into the sugar mixture until blended, then stir in the lemon juice to make a soft dough. It should not be too sticky. Spoon the dough up by tablespoons and roll into balls. Dip the balls in yellow sanding sugar, crystal sugar or granulated sugar. If you're planning on icing the cookies, you can skip this step (or use sugar AND icing like I did). Arrange about 2 inches apart on parchment lined baking sheets and press down lightly with bottom of a glass. Bake the cookies one sheet at a time on center rack for about 10 minutes or until edges are browned. Let cool on baking sheets for 3 minutes, then transfer to a wire rack to cool completely. To make the lemon icing, melt the butter in a 2 cup microwave-safe liquid measuring cup. Add the sugar to the cup and stir it around with the butter, then add lemon juice 1 teaspoon at a time and stir until the icing is a drizzling consistency. Drizzle over the cooled cookies. My daughter loves lemon! Definitely will try this one! I love lemon anything I think! These look good. I like organic butter but I’ve noticed the flavor seems to vary by time of year. Perhaps due to what the cows have to eat in different seasons where I live?